20160828, 09:19 – Visual continuity edit. I replaced Whitehouse’s placeholder background in panel five with the background I’d intended for him to have when I wrote the script. The weather icon in panel two has been changed from “sunny” to “raining” to reflect this change. More details in the metadata of the next page. The screenshots below have been updated to reflect the new panels. It’s been a pretty good week, which isn’t something that usually happens this time of year. A long-standing plumbing leak in my basement has been fixed, I spent some very unexpected christmas money on some very unplanned gifts for as many friends as I could budget for, I called home on Christmas for the first time in at least a decade if not ever, and I’m topping it off with a major piece of the plot – something I finished a few days ago but intentionally held for a holiday release. It would have been a Christmas Eve release but I got hung up on this bit – the metadata – so the GO TIME rolled to Day Of, with the next page coming sometime between now and 2016. Christmas, 2015: Dead City Radio plugs into Transitional Voices. Jason Whitehouse hasn’t been seen by Earthlings in five plot years and he hasn’t been on the front page in three real years – while I have a loose outline of what happens to him after Target -17-, this is the first indication to anyone involved in The Dualist or Transitional Voices that he’s still around. 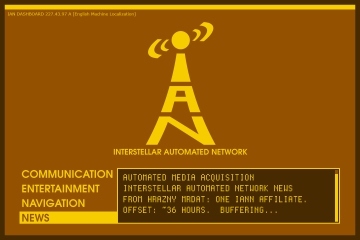 IAN – the Interstellar Automated Network – is a sort of Deep Space Usenet that’s been mentioned previously. It finally has a logo and a functional, if not particularly well-considered, dashboard interface and mobile app. 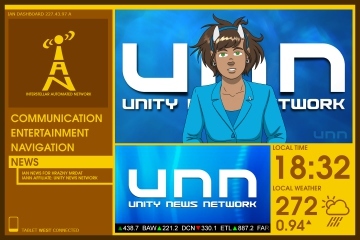 I kept it simple with the Unity News Network logo – antecedents are the CW and ISN logos. I was blocked on it pretty hard when I visited San Francisco in early November, and found the Muni logo inspiring, though had I gone in that direction the results would have been very CNN. UNN anchor Karen Gilhelm would be voiced by Diana Morgan, who played ISN anchor Alison Higgins on Babylon 5. I shaded the line art in October. At that point the page needed screens, the screens were another crazy development effort along the lines of past crazy development efforts. Another wall scaled – one that contains a few important first appearances and one very important reappearance. 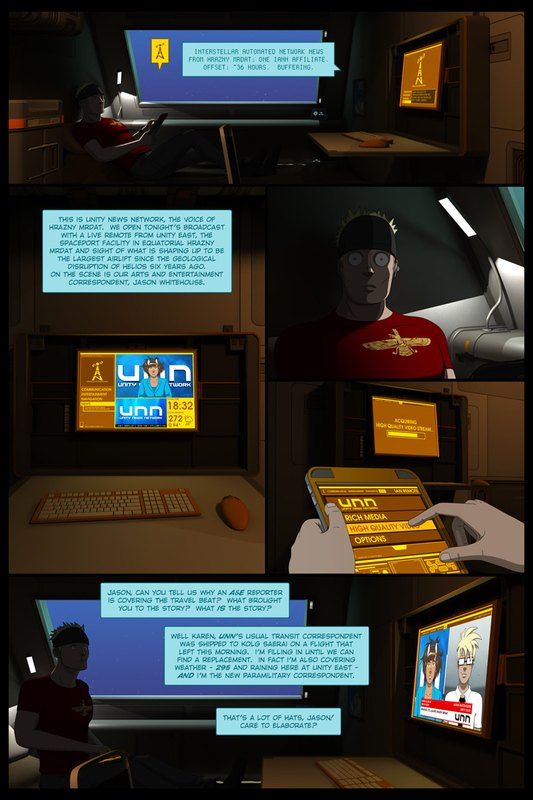 A lot of the stuff created for this page of Transitional Voices was designed with future uses in mind, which is why the screens are as detailed as they are and why, despite the delays, I was okay with this page taking awhile. I made it through the page by breaking the work down into single screens and producing one panel a day (give or take) until done. I “liveblogged” the process, sending some very sloppy phone camera photos of the screen and line art to Slava and Katy and that made the wall a lot easier to scale. Panel one: IAN dashboard/launch screen. Similar in function to Steam’s Big Picture, the xbox dashboard, etc. Panel two: IAN dashboard with rich media stream of UNN. Note the 24 hour time, temperature in Kelvin, atmospheric pressure indicator (“1” is 14.70 pounds per square inch, so 0.94 indicates lower-but-rising pressure), weather indicator, and stock ticker. BAW and ETL are plot relevant; had the ticker persisted throughout the scene other relevant companies would have popped up. 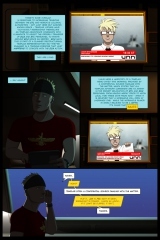 Panel four: Both screens went through several revisions before I succumbed to HollywoodOS. I’m only happy with the results when comparing them to what I started with. There’s a few more usage shots in the chapter, but after that? After that I intend to stay well clear. Panel five: Originally it was just Whitehouse in the layouts. Seeing the rendered panel with dialogue it became clear that I needed to include Karen – not necessarily for you the reader (Whitehouse is the important part, plot-wise) but for you the viewer. When you’ve got more than one on-air personality talking it just makes sense to put ’em on the screen. CLARITY! Also, foreshadowing. And holidays, which are totally going to be over if I don’t post this thing soon. Mastering notes, 2016.12.07 – Jason’s weather report now accurately reflects the weather. 107 queries in 0.996 seconds.